Dr Macgroarty was the first shoulder surgeon in Brisbane to utilise the benefits of in-office shoulder ultrasound for the prompt diagnosis and treatment of many shoulder complaints. 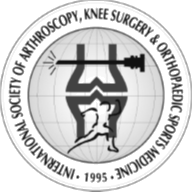 He gained experience in ultrasound techniques under the guidance of Dr Joe De Beer, shoulder surgeon from Capetown, South Africa. 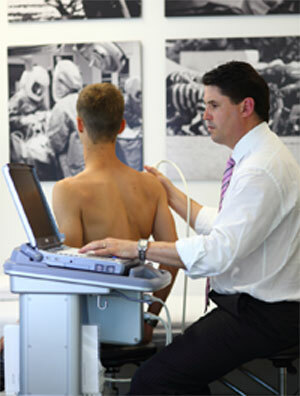 Dr De Beer has been using in-office shoulder ultrasound for over 20 years. Dr Macgroarty worked with Dr De Beer in his Capetown clinic whilst learning the skill of shoulder ultrasound. Dr Macgroarty has also completed an advanced ultrasound course at the Australian Institute of Ultrasound based on the Gold Coast. To maintain clinical skills and standards, Dr Macgroarty has attended regular musculoskeletal ultrasound and sonography conferences. Recently, he presented at the 2017 Australasian Sonographers Association Annual International Conference in Brisbane on Correlating Shoulder Ultrasound with Surgical Findings. Local anaesthetic and cortisone injections often help facilitate the differentiation between many shoulder complaints (e.g. – bursitis Vs ACJ arthritis). In addition to helping with differential diagnoses, the injections can often be a first line treatment in an attempt to avoid surgical intervention. If your GP has recommended obtaining an ultrasound-guided cortisone injection, please make a booking at our injection clinic at the Brisbane Knee and Shoulder Clinic. NB: Please bring a valid GP referral in addition to the injection request form.